The mana reduction lasts until you play a Dragon - it doesn't need to be on the current turn. A few times people have let me turn 3 Brann into turn 4 coin -> consort into turn 5 ysera. I don't always expect to get that but boy is having a dragon reduced by 4 mana fun. Consort is still better than Tuskarr Jouster, (and often better than Loatheb), and will get better over time, when more Dragons are introduced. Dragon Pally's gotten stronger since BRM; with the addition of Twilight Guardian, and recently Reno Jackson. Reno's been a huge help in my Dragon Jackson deck. It's mostly Highlander, with 3 pairs of the most essential cards for the archetype, and extra draw. I am glad that he is paladin specific. This guy doesn't really mesh well with what paladins are already doing, so it will lead to a very different paladin deck. I had a dream last night.. Turn 10, play 2 of these babies. Next dragon costs (4) Less!! Think of the combos next turn!! Don't worry. Your dream can still be realised with an even cheaper method! This comes out today. My body is ready. Turn 5 this into turn 6 Chromaggus or Coin + Ysera seems pretty solid to me. Given its cost, it would be in a control-heavy deck that employed this card. Also current Dragons cost pretty much. I don't think this will become a part of some gruesome cancer Drake Paladin deck. Think what Dragons you are going to include. It will be pretty nasty to fight against if you employ most useful Dragons, typically with very high cost, and play Holy Wrath. Giants cost more than Dragons and are more favourable with Holy Wrath set, but they cannot come on the board as easy as Dragons. I for one welcome our new Dragon Paladin overlords! We're still waiting for this card to even see play. Lol. This makes almost no sense. 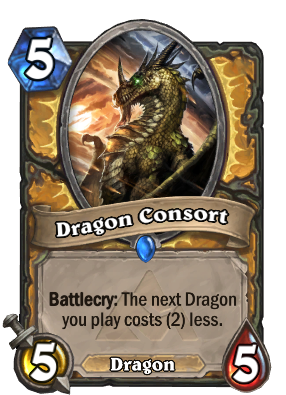 Yeah next dragon costs 2 less, but you just paid 5 mana for a dragon. At least with prep it cost 0 mana - this is just like paying an extra 3 mana for your dragon + a loatheb.